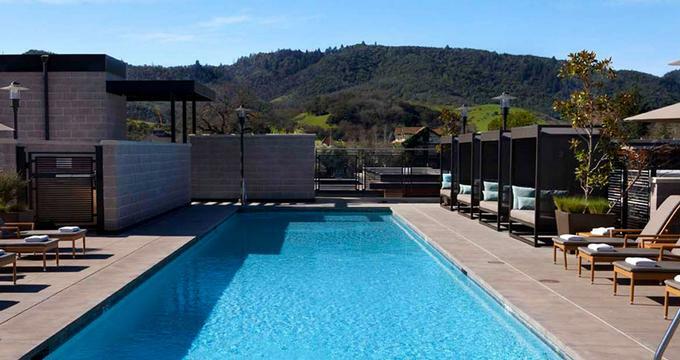 Located in downtown Yountville in Napa Valley, Badessono is a luxurious escape with a focus on local sustainability and green living. Bardessono strives to create the standard for reduction of carbon footprints while never compromising on customer service. The hotel engages in the practice of re-purposing that which normally goes to waste as the construction makes use of salvaged wood, solar panels, and automatic reduction of energy usage for low traffic rooms and areas. Most of the energy is produced on-site through the conscientious design of the building and use of the surrounding landscape. Staying at the Bardessono is a must for any conscientious traveler. The room choices range from the Spa or Steam-spa Suites, the Tufa Suites, and ADA Compliant Suites. The Spa Suite is a guest oasis with open spacious areas, natural light, and a gas fireplace. The bathroom is the star of the show with this room option, as it contains all the same amenities as a lush spa. In addition to the large soaking tub, roomy vanity, and separate walk-in shower, a hidden massage table can be folded out. 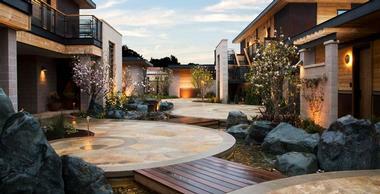 Guests can also indulge in personalized treatments from the on-site spa. The Steam-spa Suites are located on the first floor and include the added element of an upgraded bathroom with a shower steam room. The Tufa Suites are the most spacious with 750 square feet of space. These also make use of the natural light with open floor plans designed with guest comfort in mind. These suites contain a massage table in addition to the spacious bathrooms and have an outdoor shower option. All rooms boast organic Egyptian cotton linens, sustainable bath products, extra sleeping options with the pull out sofa, high speed internet, and turndown service. All rooms are 100% smoke free. Guests with special room needs can have all their needs met with the ADA Compliant Suites. These feature roll-in showers and grab bars in the bathrooms and high traffic areas. All pathways and doors are wheelchair accessible. Hearing devices are available, and all hotel amenities apply to this room. The focus on sustainability continues at Lucy's Restaurant and Bar. The menu items are comprised of ingredients from the source garden located on-site. As such, the menu changes by season according to what is growing at the time, generating a truly unique dining experience. This local establishment also makes a strong effort to maintain a relationship with local suppliers and Napa Valley farmers, with a special focus on sustainable farmers and vineyards. The garden is the mainstay and available ingredients dictate the day’s menu, meeting the standards of the Organic Farmers certification program and echoing the ongoing commitment to sustainable living. Depending on the season guests can enjoy a reserved garden party, which includes a tour and a garden cocktail and a full course garden inspired meal. In addition to breakfast, lunch, and dinner, Lucy's also features a popular Happy Hour Monday through Thursday between 4:30 and 6:30 pm, when guests can enjoy signature cocktails and specially priced appetizers. The festivities continue into the evening with playfully named house cocktails such as the Remedy or the Legend of Loch Ness. Draft and bottled beer is also available along with the famous wine list featuring locally produced wines. The connection with nature and the changing seasons continues even into the available spa treatments at Bardessono. The Spa Therapy Center is available to guests upon check-in, but also for non-guests with a minimum one-hour treatment purchase. The center includes use of the pool, locker rooms, and hot tub. The available treatments have a focus on purification and rejuvenation of body, mind, and spirit. Choices include the Bardessono Massage, which blends Swedish, Eastern, and Deep Tissue techniques. The Mom-to-Be Massage is a pampering event for expectant mothers with oils and special focus on the unique needs of the recipient. The Facial Fitness Series is another aspect of the spa that guests can enjoy. Utilizing non-invasive techniques, the staff can vitalize guests’ appearances and health with the use of micro-currents and LED red light therapy to lift collagen and LED blue light for treatment of acne. The Skin Clinic has a series of facial treatments for maximum indulgence, starting with the Essential Facial. In addition to the massage, it includes exfoliating treatments, extractions, and use of the in-house sustainable skin care products. Just one application of the Non-surgical face-lift will result in visible differences with lifted skin and a smoother complexion. There is no shortage to choose from, and all treatments can be included into a couple’s package. The Spa Butler service is available for those who would prefer to enjoy their treatments in the comfort of their rooms. In addition to the on-site fitness room, guests can join the yoga classes, which are free to hotel guests and take place from 6 to 7:15pm on Monday nights and Saturday mornings from 9 to 10:15 am. With an approved proposal guests can enjoy their special event secure in the knowledge they are participating in ethical sustainability. The luxury offered at the Bardessono is comparable to any other high-end hotel. With over 5,000 square feet of space to choose from, there is sure to be a venue to meet any need. Weddings are memorable with outdoor terraces, background water features, and an upscale poolside patio. From intimate ceremonies to spacious ballrooms, bridal parties, rehearsal dinners and receptions, all have a place at the Bordessono. Business meetings and team building events can rejuvenate those gathered. Any space is available and can be transformed into a corporate meeting local. 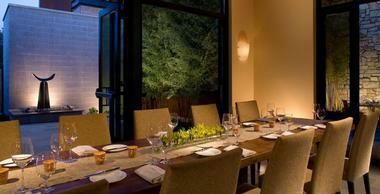 On-site group events are also available such as the Sommelier Led Wine Experience. 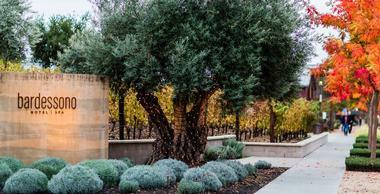 Visitors can learn detailed information about Napa Valley and the wine production of the area. This intimate group event is perfect for team building or as a way to say thanks to the wedding party. The Garden-to-Glass event has a competitive edge as guests are invited to build their own cocktails using ingredients from the garden. One of the skilled craftologists leads guests on a private tour of the garden before they begin crafting their unique creations, including coming up with a name that captures the spirit of the beverage. The competition element can be judged by the hotel staff or by people selected from the reserving group, who will judge on creativity and flavor. This event is sure to be a good time. Bordessono prides itself on the company culture of green living. Sustainability and ecological awareness is the driving point behind every decision of the establishment, and it is one of only three hotels in the United States that possesses the Leed Platinum Certification. As such it is completely smoke free, including e-cigarettes with the consequence of a $400 fee. The hotel utilizes the most advanced technologies to reduce its carbon footprint and make it a leader in business sustainability. Construction of the building was based on use of salvaged wood and a design structure that includes a geothermal heating and cooling system. All energy is produced on-site, the hotel features rooftop solar panels, and water is pulled from the underground well. The restaurant and garden are another example of the commitment to sustainability, and every brand partnered with the hotel is sought after because it shares in this commitment. A recycling and composting program is used to reduce the outgoing waste and return compostable materials to back to the garden. First Thursday is a special day of each month at Lucy's Restaurant & Bar. Guests can bring their best furry friends to enjoy the DogBar Happy Hour. Treats are available for visitors and for their dog companions for a $25 price. While the human sips on a glass of Napa Valley wine, the dogs benefit from treats and gifts especially for canines. Humans can also take part in the appetizers served during this time at Lucy's. All proceeds from these evenings go towards the Nappa Humane Society. Another offering is the Bardessono Romance Package. Honeymoons, anniversaries or a “just because” getaway are perfect excuses for indulgence. With overnight reservations, couples can enjoy a bottle of select wine, bath salts, and candles to enjoy in one of the spa rooms. Couples can spice things up with a series of questions from the Quiz Book for Couples, a playful addition to this romantic package. An in room couple’s massage can be added to this reservation. 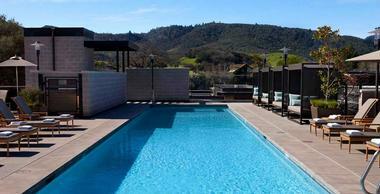 The Drift the Day Away is another popular package that allows guests to enjoy stunning bird's eye views of Napa Valley. With a reservation guests can partake in a hot air balloon ride and breakfast at Lucy's Restaurant. The V Market Place offers balloon rides exclusive to Napa Valley with room for up to five couples. The ride takes off at sunrise every day of the week, ensuring a magical soaring view of the surrounding landscape that is sure to be remembered for a lifetime. Back to: Honeymoon Weekend Getaways.